Put a dirt penny in the cup and cover it with lemon juice. Wait about five minutes then remove the penny and wipe it off with a paper towel. Try the taco sauce to see which works better. Pennies are made out of a metal called copper. The copper mixes with oxygen, the same gas that we breathe. This cause something called oxidation and makes the penny look dirty. 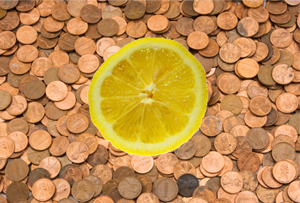 Lemon juice has acid in it that removes the dirty color or oxidation and makes the penny nice and shiny again! If you color the penny with marker does it come off? Does it work with nickels, dimes or quarters?